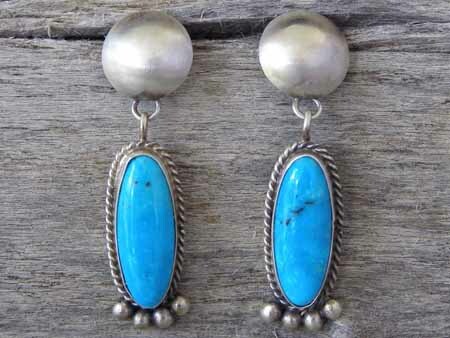 These drop earrings by Navajo smith Selena Warner are set with long ovals of blue Kingman turquoise on the drops. These drops swing freely from convex buttons attached to the posts. This is very similar to an earring style made by her step-mother Betty Joe, who is Harry Morgan's widow. The stones are set in smooth bezels wrapped with twist wire and an arc of accenting raindrops wraps around the bottom edge of the free-swinging drop. Hallmarked SW and stamped Sterling on the back of one drop.